The Puget Sound watershed has gone through extraordinary change in just a few decades. As conservation groups wrestle with ways to protect the region’s environment, a key priority in many cases is also to “restore” Puget Sound to its former health. But what is a healthy Puget Sound? To what condition do we seek to restore it? In short, what was the environment of Puget Sound like? Ask a scientist, and they are likely to give you answers in quantifiable terms: salmon counts, ocean acidity, measurements of Orca populations... There is a universe of data out there. In this spirit, we feature a new series called “Puget Sound Voices.” We will talk to people that remember the Puget Sound ecosystem— or that have researched it, such as historians or other scholars— and get their stories. These might include scientists, fishermen or tribe members, or the person with whom I spoke recently, Vern Morgas. 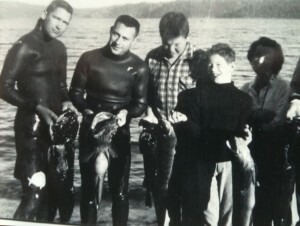 Morgas is 86 years old and has the distinction of being the first person (ever) to scuba dive in Puget Sound. His recollection was that the water was a little murky in Hammersley Inlet where he made his first dive, but that the spearfishing was good. “I didn’t think of it as being a pioneer,” he says. “To me, it was just so much fun.” He learned to scuba dive in California and bought his first air tank and regulator directly from the legendary Jacques Cousteau. After his inaugural dives, he became a scuba instructor and over the years taught thousands more to scuba in Puget Sound. Stay tuned as we add occasional interviews from fascinating scientists and explorers from around Puget Sound. This Encyclopedia's parent organization, the Puget Sound Institute, also publishes an email newsletter. Visit the PSI blog to subscribe to the PSI eNews or peruse past issues.